Give kids the creative tools they need to create exciting outdoor art with the Crayola Washable Chalk Collection. These chalk sticks come in 64 different bright, bold colors and leave clear, vibrant marks on concrete or asphalt. When kids are done for the day, the chalk washes away with water. 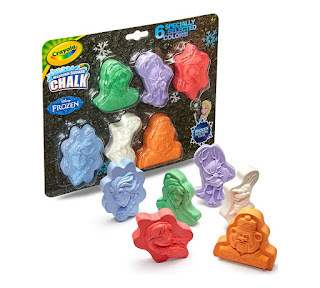 Crayola Washable Sidewalk Chalk “disguised” as your favorite characters from Disney’s Frozen! These fun, familiar shapes are perfect for creative outdoor art and imaginative make-believe play! Each character-shaped chalk is sized just right for kids hands too. Includes six washable colors. Design and spray on colorful outdoor designs with the Crayola Washable Sidewalk Paint Sprayer. This sprayer lets you transform any ordinary outdoor surface, even those covered with snow or grass, into a blank canvas for your creativity. 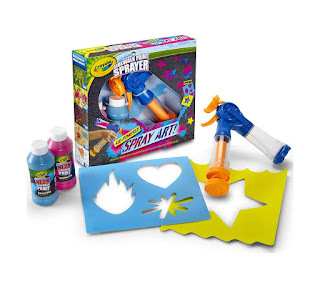 Made for ages six and up, the Paint Sprayer comes with two pre-filled paint cartridges, two stencils, and an instruction sheet to help get you started. 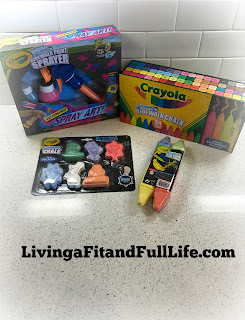 It's just not summer without some outdoor fun from Crayola! My kids love anything and everything from Crayola but they especially love Crayola's outdoor products because it means they get to hang out outside and be as creative as they want to be. They usually deck our sidewalks out with their chalk artwork, play tic tac toe and so much more. As a mom of four, I love that when they need more room, or we need to clean things up, we simply get the hose out and spray it down. Then, the fun can start all over again. Crayola's 64 ct. 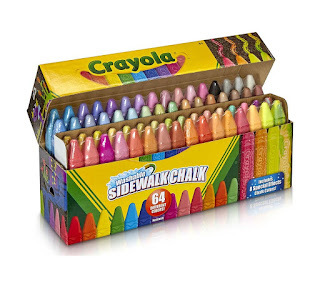 Ultimate Sidewalk Chalk Collection is like the ultimate chalk collection and has every color of chalk imaginable. When I brought out this box of chalk my kids face's lit up! My 4 year old loves Frozen so you better believe she was excited for the 6 ct. Washable Frozen Chalk Shapes! I think she carried them around for days in her purse before she even used them. Crayola's Sidewalk Paint Sprayer is a blast! My kids love how easy it is to make fun designs with the stencils and even had a blast creating some of their own custom designs. Crayola has some amazingly fun products for summer that are sure to help create memories that will last a lifetime.